NCIS has never rested on its laurels. By Season 5, it had seen the retirement and reinstatement of its lead character and the deaths of two major supporting characters. Between Seasons 5 and 6, however, it took perhaps its biggest risk yet—breaking up its team of regulars. In the season premiere, we learn new director Vance (Rocky Carroll) broke up the team in hopes of exposing a traitor within NCIS. By the end of the episode, we’re surprised to learn the traitor is recurring Special Agent Michelle Lee (Liza Lapira). Lee reappears in the mid-season episodes “Collateral Damage”, “Cloak”, and “Dagger”, finally revealing she’s been blackmailed to pass military secrets to a controller who has kidnapped her younger sister. The season’s second major arc involves unsanctioned assassinations by Mossad agent Michael Rivkin (Merik Tadros) on U.S. soil, testing Ziva David’s loyalties. For two late-season episodes, the hunt for Rivkin leads to Los Angeles, bringing in an undercover team of NCIS agents (a backdoor pilot for the spinoff NCIS: Los Angeles). “Agent Afloat”, focusing on one of DiNozzo’s cases aboard the U.S.S. Seahawk. “Heartland,” drawing Gibbs back to his hometown of Stillwater, Pennsylvania and reuniting him with his father (played by Ralph Waite). “Bounce”, in which DiNozzo re-opens an investigation he headed while Gibbs was retired and Gibbs follows his lead. “South by Southwest”, in which Gibbs and DiNozzo go on horseback to track a murderer through Arizona. Disc One: “Bodies of Work” featurette hosted by Brian Dietzen (“Jimmy Palmer”) about how the dead bodies seen on NCIS are constructed. Disc Two: A DVD exclusive acoustic version of Pauley Perette’s song “Fear”. Disc Three: “Starting With a Bang” featurette about how the writers plotted how to bring the team back together and maintain interest throughout Season 6. Disc Four: Commentary on the episode “Broken Bird” with David McCallum and James Whitmore Jr., and on “Bounce” with Michael Weatherly. Disc Five: Commentary on the episode “Toxic” with Pauley Perrette and Sean Murray, and “Horsin’ Around”, a featurette on the making of “South By Southwest”. 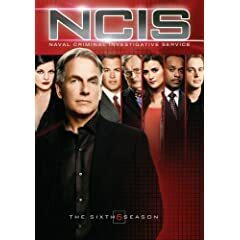 Disc Six: “Cruising Along” season recap and “Six Degrees of Conversation”, a conversation with the cast on their favorite moments of Season 6, hosted by Entertainment Tonight’s Kevin Frazier.